Northstar Truck Wash is the "Ideal business" to take care of your business and recreational needs. We have a "State of the Art" Wash with features such as: "Gantry" Automatic Trailer Wash, "No" Corrosive Acids, Scrub all Tractors, Underbody Wash, Rain-X, and Large Lot which makes it easy to Enter and the ONLY place in town for Hopper Washouts! Northstar Truck Wash is the “Ideal Business” to take care of your business and recreational needs. We have a “State of the Art” Wash with features such as: “Gantry” Automatic Trailer Wash, “No” Corrosive Acids, Scrub all Tractors, Underbody Wash, Rain-X, and Large Lot which makes it easy to Enter and the ONLY place in town for Hopper Washouts! Northstar Truck Wash is locally owned. The owners, Kent Krabbenhoft and Randy “Hogie” Hogenson, are from the Fargo-Moorhead community and know exactly what it takes to provide quality service and customer satisfaction! We take pride in the work we do and take our time in ensuring the job gets done right. 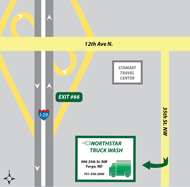 Northstar Truck Wash is open 24-7; accepts VISA, Discover, Mastercard, T-Chek, EFS, Comdata, and Stamart. There is an ATM machine onsite available to all customers. We cater to customer’s needs and specific requests. We also offer monthly specials, promotions and gift certificates for customers to purchase. “Shine with the Star” at Northstar Truck Wash - No job is too big or small, our expertise, professionalism, and dedication to our customers is getting praise from customers throughout the country and Canada!!! Come on over, let us take care of your needs and we can guarantee 100% satisfaction – you can’t go wrong when you leave the work to the best!!! !